With much excitement, resolve, and intent, we’re pleased to finally launch our new podcast series Real Talk with Ramola D and Ahmad Enani, and finally release these two opening group conversations with researcher and realtor Midge Mathis and retired Intelligence analyst and NSA whistleblower Karen Stewart, on the subject of the discoveries Midge has made recently that seem to relate to and reveal the financial understructure of the EMF/Neuro targeting, testing, experimental and political repression operations being run today on civilians in the USA and worldwide. Real Talk with Ramola D and Ahmad Enani is a podcast series that has been in the works for some time now, stymied for quite a while by excessive sabotage attempts centered around massive cyberhacking on all sides. As you’ll note however, particularly in the first video, which we ran on Google Hangout, we pushed through despite obvious tampering with my video feed and Ahmad’s audio feed, set-up audio delays, and consequent disjointedness. We think this evidence of sabotage of our very first podcast is historic, related quite possibly to Google’s close connections with the CIA, and related as well to the fact that each one of us, particularly both hosts, is being surveilled and obstructed quite heavily these days as we expand our True Media and journalism efforts, in the interests of keeping the world informed. Ultimately, we think, these glitches are a reflection of the video platform we used, and a reflection on the selective viability of Google Hangout and Youtube. For our second video as well, where we recorded from Skype, and uploaded to Youtube, delays in uploading and downloading were excessive. Unforeseen glitches developed, prompting us to re-examine the intention of launching our series with these two videos. We continue to research better platform options, and will aim to improve audio and video quality as we go along. Real Talk with Ramola D and Ahmad Enani has been launched with the express intent of offering both of us–and our guests–a means to engage openly in Candid Conversations on 21st-Century Science/Technology and Ethics/Human Rights issues, as well as Covert Crime, which latter we unfortunately see flourishing all around us today, as Secrecy is funded copiously and Freedom flails. We believe in the great value of open, untramelled conversation, in free speech, in public discussion and debate, in the paramountcy of privacy, individuality, independence, free will, human rights, and in public education–even as Global Totalitarianism runs amuck in our midst. As we launch this quest to openly discuss the realities of watchlisting, uber-surveillance with electronic weaponry/RF and sonic weapons–dismissed and lied about in Mockingbird-run Mainstream Media’s government propaganda coverage of “Targeted Individuals” (TIs)–as well as other current-day realities such as chem trails, 5G, and military quests for full-spectrum dominance, we’d like to note that no subject related to the ongoing covert criminal assaults on humanity will be forbidden to us. We hope as we go along to run both small-group conversations and one-on-one interviews on the most vital subjects of our time, bringing in both experts and individuals; we will aim as well to collect and publish (in our podcasts) targeting testimonials and personal stories, in the interests of creating a 21st-Century Documentation Archive, a recorded, documented archive of this dark and inexplicable time period in history. In this first conversation, MIdge Mathis relates the story of her own targeting, her background as a realtor and real estate developer, and describes how she began to make a series of discoveries of front companies and backdoor interconnections with security and Intelligence services such as the DHS and the NSA, of fraudulent trust funds and insurance fraud. Are there companies and people hiding in Covert America making money off the targeting operations on Americans, where innocent Americans are being covertly implanted and assaulted with microwave weapons, night and day, on a 24/7 basis, in New Phoenix “extermination programs”? How are telecom companies, banks, research institutions, medical equipment companies, Defence contractors involved? How are top executives in the NSA involved? Who benefits from secretive weapons testing, electronic surveillance, and neurotechnology experimentation on innocent, non-consensual citizens–and how? This episode seeks to find out. This podcast continues the wide-ranging conversation begun in Episode 1, recorded in Skype with Ahmad Enani on audio, and Ramola D on video, along with researcher Midge Mathis and former NSA Intelligence analyst Karen Stewart on video. In this episode, Midge describes searches she has run on her county assessor website’s database in quests to understand the material understructure of illegal targeting activities being run undercover today by fusion centers, military contractors, and Intelligence agencies which reveal astonishing and peculiar connections between agencies like DARPA and DHS’ “Surveillance Role Players,” between doctors and local businesses, between DHS and mental health hospitals, and others. Midge relates discovery of frequencies emitted by implants not recorded in FCC frequency allocation tables, and discusses how those innocents and activists who are targeted are channeled into misdiagnoses by mental health professionals and discredited, while being implanted and assaulted with covert EMF/neuroweapons. Connections between various businesses, including banks, telecom companies, microchip technology companies, Defence contractors, Air Force, and agencies in Surveillance activities are explored. While many questions remain, these database explorations offer a basis for further analysis and investigation, as these illegal targeting and experimentation activities in the USA and worldwide continue to be investigated. These conversations with Midge Mathis and Karen Stewart continuing these database explorations and exposes of the corporate profit structure behind targeting, surveillance, and human experimentation, and examining the significance for humanity will be resumed in future podcasts. On this particular subject, “white hat” hacker and computer experts are urged to step forward and work with us to help us understand the information that these databases are storing, apparently in plain sight. Will these discoveries offer Americans a means to start taking our country back? And from there, a means also to take the entire world back from the criminal and corporate NWO Globalists? It seems entirely possible. Real Talk True Media schedules and upcoming guests will be announced shortly on a separate website, with all information posted here at The Everyday Concerned Citizen as well, please stay tuned for updates. We hope to run these podcasts weekly, and invite comment and participation from all viewing these videos. Our interests are nothing less than exploring the truth, speaking the truth, and publishing the truth. Please join us! Ahmad Enani is a film and media professional, an actor and director with experience working out of Los Angeles with over 25 plays in his repertoire, including a lead role in the Mark Taper Forum’s “For Here Or To,” which took home Garlands for Ensemble and Play of the Year. He is a former longstanding member of Independent Shakespeare Company, a nationally renowned professional theatre based in Los Angeles. With a degree in philosophy from Vanderbilt, he is a Teach for America alumni and former inner city high school teacher. With a background and interest in science, he has worked as an IT consultant for many years. Active in radio and new media journalism, he is an activist for human rights and targeted individuals all over the world with a deep understanding of the web of conspiracies that saturate our present world. Ramola D is a writer, journalist, and activist investigating issues related to 21st-century science and technology, ethics, and human rights in relation to surveillance, military contracts, and non-consensual experimentation. Publisher of the solutions-journalism site The Everyday Concerned Citizen, she edits Delphi Quarterly and runs creativity workshops at ArtCreateWrite. With an MFA in Poetry, an MBA, and a BS in Physics, she has taught Creative Writing and Composition for 17 years at Washington, DC universities, recently at The George Washington University and The Writer’s Center, Bethesda. Her awards include an AWP Grace Paley Prize in Short Fiction and a National Endowment for the Arts Fellowship in Poetry. Her second collection of short fiction, For the Sake of the Boy, is forthcoming from Paycock Press in 2018. Re-posting three recent posts from Judge Anna von Reitz, from Paulstramer.net, with many thanks. Please visit Paulstramer.net for the original posts and comments from readers. On the subjects of the wide-ranging and long-lasting (and immense) trust fraud against the peoples of the USA, Commonwealth countries including Canada, Australia, others. I thought it might help to post these three together, so the subject under discussion–the historical role played by the British Crown and the Federal United States in creating our present reality–in the USA, Canada, Australia, Ireland, Scotland, Wales, many other Commonwealth countries–through trust fraud–is better comprehended. For other Judge Anna posts covering this history on this site, please click here. For updated posts and for an archive of her recent writings, please visit annavonreitz.com and paulstramer.net. The Enfranchisement Act of 1867 championed by Benjamin D’Israeli toppled the English government from within, engaged Queen Victoria in unlawful acts against the people of Britain and betrayed their established government all the way back to the Magna Carta. D’Israeli enslaved the people of Great Britain to finance the enslavement of the Indian Subcontinent under the Raj. As long as Queen was going rogue at home and secretively enslaving the people of Britain, what did she care about pillaging and betraying her allies in Europe, the Americans, the Australians and a few Canooks? This is the thanks we all get from the British Royals for our sacrifices and loyalty through two World Wars and countless police actions ever since: press ganging, enslavement, inland piracy, unlawful conversion, personage, barratry, and fraud, fraud, fraud. We are dealing with exactly the same criminality and the same evil that Gandhi faced in India, but unlike Gandhi, we are not facing it alone. In evaluating this deceptive and perfidious Enemy of all free people everywhere, consider the lack of conscience and morality involved when a government taxes poor people for salt that they need to live and which they have harmlessly harvested from the sea for millenia? That’s what the Raj did in India. That’s what the British Crown is capable of. That is what Prince William’s throne is built upon. It’s not his fault. He is inheriting the situation his Great-great-great Grandmother left him and he will be hard pressed to make sense of it or find a way forward out of this system of betrayal and criminality without a velvet boot up his backside pointing him the right direction. It’s our job to be that boot and make sure that this system of things is brought to a peaceful and sane conclusion in which still more innocent people do not suffer. Gandhi and Jesus have both showed us the way to defeat this Evil in high places—- millions of people must join hands and expose the cruelty and criminality and oppressive nature of the British government so that it becomes so embarrassing, so obvious, so insurmountably distasteful that both from within and without the denizens of Westminster are forced to relinquish their vile claims of ownership and control over the rest of us.. The State did not give the Citizen his rights and thus cannot take them away as it chooses. The State did not establish the settled maxims and procedures by which a citizen must be dealt with, and thus cannot abrogate or circumvent them. It thus is well settled that legislative enactments do not constitute the law of the land, but must conform to it. The general rule is that an unconstitutional statute, though having the form and name of law, is in reality no law, but is wholly void, and ineffective for any purpose; since unconstitutionality dates from the time of its enactment, and not merely from the date of the decision so branding it. Any court, government or government officer who acts in violation of, in opposition or contradiction to the foregoing, by his, or her own actions, commits treason and invokes the self-executing Sections 3 and 4 of the 14th Amendment and vacates his or her, office. Please note that The Constitution is for inhabitants of the Federal United States LITERALLY the law of the land— because when they come in from their watery international jurisdiction, they are required to operate by the rules established by The Constitution on the land. When reading Federal law, you must always read it from the Federal perspective. They operate in the international Jurisdiction of the Sea, so, of course, the national law they are obligated to respect when dealing with us is –from their perspective— the Law of the Land. It’s the same reversal when they speak of “inhabitants”—- we are “peaceful inhabitants of the land” (14th Amendment of the corporate Constitution) from their perspective, whereas they are “inhabitants” of the “maritime regions and insular states” from ours. We did not suddenly lose our political status as one of the “free sovereign and independent people of the United States” under the terms of the Definitive Treaty of Peace 1783 because they called us “inhabitants of the land” in their private corporate “constitution” of 1868—-even though the two different uses of the same word in two completely different documents was no doubt meant to confuse identities and issues of political status that should never have been confused at all. Why call a corporate “constitution” the Constitution of the United States of America, if you did not mean to confuse it with The Constitution for the united States of America? Why call us “peaceful inhabitants of the land” if you did not mean to confuse us with the British Subject “inhabitants” referred to in the Definitive Treaty of Peace 1783? This use of “deceptively similar names” has been carried on throughout the long effort to mischaracterize and defraud the people of the United States by operatives of the British Crown and the British government. How better to undermine our lawful government, if not to do it under a veil of “friendship” and treaties promising “perpetual amity” and while acting in the guise of being our “Trustees” in the realm of international commerce and as our”allies” in war? Who could ever suspect our “Mother Country” of seeking our demise? Now that we have identified at least a large part of The Problem, let us quietly and determinedly proceed to hold the Lord Mayor of London, the Lords of the Admiralty, and the Queen fully accountable for these outrages against the British people and against all the rest of us, too. We were all promised and guaranteed certain things and we all know what we have received instead. As it was in the days of King John, it is again, when the leaders of the people must rise up and demand their rights or lose them, must expose the criminality we have lived with too long or condemn our children. It is time for the Natural Rights of Mankind to be asserted and for idolatry to end. They may kill our bodies, but they cannot kill our spirits; and they shall not win. Seen from that perspective you can see why Congress acted as it did. From their perspective the land was at peace and in control of whatever the sea did or did not do, as the sea jurisdiction operated by the Federal United States has always been just a delegation of 19 enumerated functions to be done in behalf of the States. They don’t even have all of the powers on the Sea— just some of the sea jurisdiction has been delegated. And if the States want to get together and amend the deal to give the Federal entity more or less power, they can convene a Continental Congress and do so. The problem is that in a sense, we have forgotten who we are and what our powers are and what powers we delegated to them and how we can also take back any power delegated to them. They are in effect just serving us with “essential governmental services”– but like runaway housemaids they have been defining what those services are and how much they are going to charge for them and how they are going to “represent” us, etc. Just imagine that the servants have taken over a grand estate, pretended that the lawful heirs are “missing”, and wrecked all sorts of destruction, run the Master’s credit cards up to the hilt, failed to do basic maintenance, charged a hundred times more than reasonable for basic services and worst of all, enslaved and made the actual heirs miserable. That is the situation we have here. The government of Britain is responsible, has acted in Breach of Trust, and deserves to go down in flames for it. They might have pleaded “wartime necessity” during WWII, but at no time since then has there been any rational excuse for any of this abuse of the rest of us and the violation of our contracts. This has all only been possible because the American People trusted the British Monarch to perform their duty as their Trustee on the High Seas and Navigable Inland Waterways. It is now clear that that trust was tragically misplaced and that the British Monarch has instead attacked and victimized the trusting Americans and has behaved in the severest kind of Dishonor imaginable to us, to the Canadians, Australians, and other Allies of the WWII Era. The blame for the current situation lies squarely on the British Monarch, the Lords of the Admiralty, FDR, and the Members of Congress. As the Federal United States is a separate nation with respect to the Continental United States, this egregious betrayal is a matter of international law and treaty violation. All member nations of the former British Empire have been similarly abused and defrauded as well as many other countries worldwide. For the Americans, Canadians, and Aussies it is summed up as blatant fiduciary trust fraud. Please post this under a heading — Britain Guilty of Fiduciary Trust Fraud Against Americans, Canadians, and Aussies– because that is the major portion of what has gone on since WWII. They have enslaved us and their own people on the British Isles proper and have attempted as much as possible to enslave other nations, too, for no very apparent purpose other than to accrue ill-gotten gold and silver reserves for the Queen and numerous Royal Slush Funds. The aim appears to have been to steal all the gold and silver of other nations in order to later sell it all back to them at vastly inflated prices. In the Americans case the stooges in “Congress” set up a fixed exchange rate between “Federal Reserve Notes”– private I.O.U’s– and actual United States Dollars defined as an ounce of pure silver. They thus “exchanged” their worthless promises to pay for our actual silver and gold, then claimed bankruptcy and discharged the entire debt they owed to the American People for this outrage. I haven’t inquired but it is virtually certain that they did the same to Canada and Australia and as many other nations as possible. This leaves the perpetrators in possession of vast amounts of precious metals which are now grossly overvalued in comparison with all the fiat currencies. Consider that gold traded at about $30 USD per ounce in the 1930’s and now trades for around $1300 per ounce and you can see that the rats hope to realize an over 4000% profit from their crimes against the innocent people who trusted them to act as their Trustees on the High Seas and Inland Waterways and that they have pretended to excuse this vile behavior by purposefully entrapping and mischaracterizing the political status of their victims— attacking us while still babies in our cradles and falsifying public records without our knowledge or consent so as to give themselves an excuse for their criminality. Well, it isn’t going to work. You and I and all the others who have been mistreated and lied to and lied about by these monsters now completely understand their motives and their methods and their time on Earth is at an end. Having been recognized for what they are and having their methods recognized for what they are makes it impossible for them to continue or to profit from their schemes. They have virtually every nation on this planet arrayed against them, including the people of the Continental United States. Both the Queen and Jacob Rothschild are revealed to be nothing more than criminals. Their fortunes must be forfeit to the people they have been stolen from and the gold standard– or any standard based on one or a few commodities– must ultimately be rejected. I repeat– does it make any sense to use a single commodity — the supply of which is controlled by evil men– the standard of value against which all other commodities including human labor are measured? Doesn’t it make more sense to admit the truth that the only sources of value on Earth are labor and natural resources and to use ALL these sources of value as collateral backing a single universal currency? This immediately foils all attempts by the criminals to control and manipulate the world economy, to profit themselves via their theft of gold and fraudulent claims against their victims, and leave themselves in control of all the rest of us. Time to cut the shackles of gold, of verminous Queens, of incompetent Popes, and dishonest “Trustees” and also time to deal with employees run amok. What is the Nature of the Fraud Against Us? The fraud against us begins when the governmental services corporation misrepresents itself as the lawful government and gets us to trust it and go along with it under the false presumption that it is our government when in fact it is just a corporation in the business of selling governmental services. The next fraud is when they seize upon your given name and copyright it and steal your identity without telling anyone they are doing this. The third fraud is when they create a trust in your NAME and change your birthright political status without telling anyone. The fourth fraud is when they fail to tell you that you have the right to reclaim your birthright status and have to take action to do so. The fifth fraud is when they fail to provide a simple and official process by which to correct the records and repatriate to your native status. Fraud occurs anytime a Material Fact is misrepresented or omitted so that the victim takes an action which is detrimental to him or fails to take an action resulting in harm to him. And fraud has no statute of limitation. As you can see, the self-interested governmental services corporation benefits greatly financially and in terms of holding power over you from doing all this behind the scenes paper-pushing and copyrighting and political status changing—without telling you anything about it. And as you can also see, it’s all pure fraud. Of Thumbprints, Names in ALL CAPS, Legal Fictions, and Name Fraud–David Robinson: Do Not Use Your Thumbprint — Ever!!! The Truth About US Govt–USA 101: (3) Doreen Agostino: CALL TO DUTY! The Truth About US Govt–USA 101: (10) AL Whitney/Anti-Corruption Society: Our ‘government’ is just another corporation! Spiro/Coverage of the Dennis Hastert Scandal: Sibel Edmonds Exposes Exactly What Could Bring Down This Entire Corrupt System! Posted below is independent video journalist Spiro‘s recent interview with Sibel Edmonds, author of Classified Woman: The Sibel Edmonds Story and the novel, The Lone Gladio, ex-FBI translator and whistleblower, George Mason University alum (like myself:), and force extraordinaire in the world of independent investigative journalism, who runs the website Boiling Frogs Post, and has published long-standing coverage of the Dennis Hastert story, which, she notes, is being covered up in mainstream media. Please visit her website for this coverage–small excerpt below–and listen to all her interviews on this subject, including the one below–for a very inspiring call to action to all of Us, independent and individual readers, writers, and thinkers everywhere, who, she notes (and Spiro agrees), are the only force, truly, who can most powerfully oppose, expose, challenge, and force the termination of all the corruption, evil, and injustice endemic in this system we are all caught up in, please stop in at 48:30 of this video, you will be fired up. Let’s Counter the Complicit US Media with Our Own! 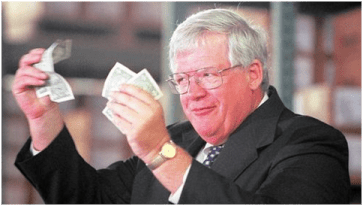 We have been singlehandedly covering The Real Hastert Case here at Boiling Frogs Post. As we all know the complicit US media has been doing exactly the opposite: blacking out and censoring the real case together with all directly relevant facts and historical context. I believe we have a choice to make: Do we let them win again by shrugging in disgust and going away? Or do we give it our best and use every means and every channel to counter and challenge the institutionalized criminality and cover-up? Sure. They have all the mega print and TV outlets. But we have the power of numbers, resolve and persistence. And we have this website, the internet and all the social networks and forums that go with it. Can we use these mediums and means and show that we are not as powerless and irrelevant as they want us to believe we are? Can we use our numbers, our collective voices and various internet mediums and means to get out the quashed facts and the truth? I cannot answer these questions. But together, we can. The least we can do is to try- and try our best. We can make this our own campaign- the people’s campaign.